Because of heart failure, not enough blood leaves the heart with each beat. There are two types of heart failure. Both affect the ventricles’ ability to pump blood. You may have one or both types. 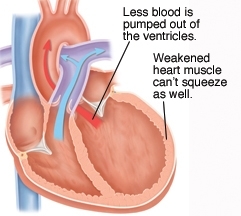 The heart muscle becomes weak and enlarged. It can’t pump enough blood forward when the ventricles contract. Ejection fraction is lower than normal. 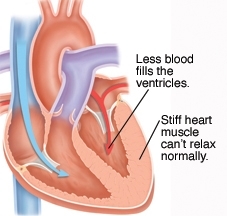 The heart muscle becomes stiff. It doesn’t relax normally between contractions, which keeps the ventricles from filling with blood. Ejection fraction is often in the normal range. When the heart doesn’t pump enough blood, hormones (body chemicals) are sent to increase the amount of work the heart does. Some hormones make the heart grow larger. Others tell the heart to pump faster. As a result, the heart may pump more blood at first, but it can’t keep up with the ongoing demands. So, the heart muscle becomes more damaged. Over time, even less blood is pumped through the heart. This leads to problems throughout the body.